Summary: Researchers report a link between exposure to air pollution during pregnancy and abnormal brain development in the offspring, which can lead to cognitive problems throughout life. A new study performed in the Netherlands has linked exposure to residential air pollution during fetal life with brain abnormalities that may contribute to impaired cognitive function in school-age children. 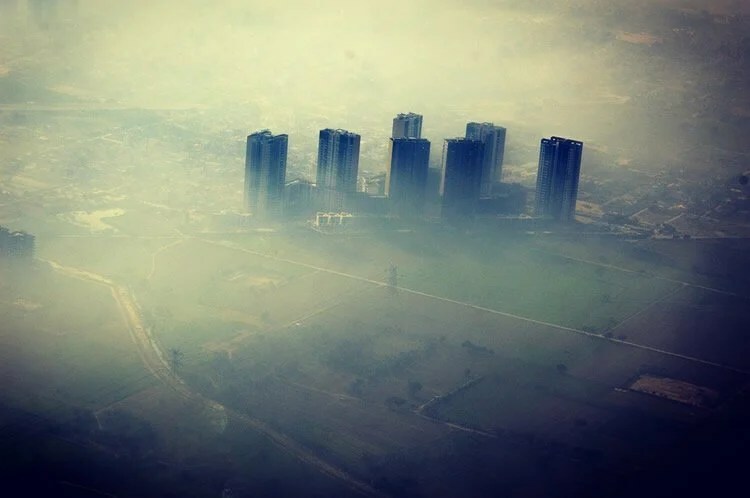 The study, published in Biological Psychiatry, reports that the air pollution levels related to brain alterations were below those considered to be safe. “We observed brain development effects in relationship to fine particles levels below the current EU limit,” said lead author Mònica Guxens, MD, of Barcelona Institute for Global Health (ISGlobal), Spain, a center supported by the “la Caixa” Foundation, and Erasmus University Medical Center, the Netherlands. This finding adds to previous studies that have linked acceptable air pollution levels with other complications including cognitive decline and fetal growth development. “Therefore, we cannot warrant the safety of the current levels of air pollution in our cities,” said Dr. Guxens. Exposure to fine particles during fetal life was associated with a thinner outer layer of the brain, called the cortex, in several regions. The study showed that these brain abnormalities contribute in part to difficulty with inhibitory control–the ability to regulate self-control over temptations and impulsive behavior–which is related to mental health problems such as addictive behavior and attention-deficit/hyperactivity disorder. The study used a population-based cohort in the Netherlands, which enrolled pregnant women and followed the children from fetal life onward. Dr. Guxens and colleagues assessed air pollution levels at home during the fetal life of 783 children. The data were collected by air pollution monitoring campaigns, and included levels of nitrogen dioxide (a prominent air pollutant caused by traffic and cigarette smoking), coarse particles, and fine particles. Brain imaging performed when the children were between 6 and 10 years old revealed abnormalities in the thickness of the brain cortex of the precuneus and rostral middle frontal region. Despite the relationship between these brain structure alterations and fine particle exposure, the average residential levels of fine particles in the study were well below the current acceptable limit set by the EU–only 0.5 percent of the pregnant women in the study were exposed to levels considered unsafe. The average residential levels of nitrogen dioxide were right at the safe limit. The fetal brain is particularly vulnerable during pregnancy–it hasn’t yet developed the mechanisms to protect against or remove environmental toxins. The findings of the study suggest that exposure to levels even below those considered safe could cause permanent brain damage. NeuroscienceNews.com image is in the public domain. “Air pollution is so obviously bad for lungs, heart, and other organs that most of us have never considered its effects on the developing brain. But perhaps we should have learned from studies of maternal smoking that inhaling toxins may have lasting effects on cognitive development,” said John Krystal, MD, Editor of Biological Psychiatry. The fetal brain is particularly vulnerable during pregnancy–it hasn’t yet developed the mechanisms to protect against or remove environmental toxins. The findings of the study suggest that exposure to levels even below those considered safe could cause permanent brain damage. “Although specific individual clinical implications of these findings cannot be quantified, based on other studies, the observed cognitive delays at early ages could have significant long-term consequences such as increased risk of mental health disorders and low academic achievement, in particular due to the ubiquity of the exposure,” said Dr. Guxens. Original Research: Abstract in Biological Psychiatry. Elsevier “Air Pollution Linked to Brain Alterations and Cognitive Impairment in Children.” NeuroscienceNews. NeuroscienceNews, 8 March 2018. Elsevier “Air Pollution Linked to Brain Alterations and Cognitive Impairment in Children.” http://neurosciencenews.com/air-pollution-brain-alterations-8602/ (accessed March 8, 2018). Air pollution exposure during fetal life has been related to impaired child neurodevelopment but it is unclear if brain structural alterations underlie this association. The authors assessed whether air pollution exposure during fetal life alters brain morphology and whether these alterations mediate the association between air pollution exposure during fetal life and cognitive function in school-age children. We used data from a population-based birth cohort set up in Rotterdam, The Netherlands (2002-2006). Residential levels of air pollution during the entire fetal period were calculated using land-use regression models. Structural neuroimaging and cognitive function were performed at age 6-10 years (n=783). Models were adjusted for several socioeconomic and life-style characteristics. Mean fine particle levels were 20.2μg/m3 (range 16.8-28.1). Children exposed to higher particulate matter levels during fetal life had thinner cortex in several brain regions of both hemispheres (e.g. cerebral cortex of the precuneus region in the right hemisphere was 0.045mm thinner (95% Confidence Interval 0.028-0.062) for each 5μg/m3 increase in fine particles). The reduced cerebral cortex in precuneus and rostral middle frontal regions partially mediated the association between exposure to fine particles and impaired inhibitory control. Air pollution exposure was not associated with global brain volumes. Exposure to fine particles during fetal life was related to child brain structural alterations of the cerebral cortex and these alterations partially mediated the association between exposure to fine particles during fetal life and impaired child inhibitory control. Such cognitive impairment at early ages could have significant long-term consequences.